It was a fraction of the price of the top tier holographic sights and boasted that it was fully adjustable for brightness, had 4 different reticle patterns and produced a choice of 2 colors (red or green). The owner of the shop said, “No catch, just one of the best kept secrets in the Holosight world”. 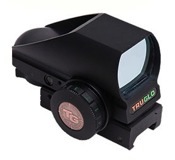 I had used TRUGLO sights in the past, but did not know that they were making a holographic weapon sight. I gambled on it–preparing to be disappointed–and mounted it on a Colt M4 chambered in .22LR. The green sight was a welcome change from the standard red, for some reason my eye picks out this color much faster. It co-witnessed the backup iron sights as well as my EOTech does on my 5.56 rifle and held zero through 5 or 6 boxes of .22LR. While I am not ready to try this out on a decent rifle caliber or a pistol round above 9mm, I am told that others have done so with success. I feel this sight is perfect for use on pistols and rifles in .22LR or on an airsoft weapon if one wants the look and feel of a genuine holographic weapon sight without paying the high price. Click here to check current pricing and read customer reviews on Amazon.com.